Earlier that day my oldest son and I met in the kitchen, each looking for something eat. We realized that we were both home for the rest of the day; me with a day off from work and he had finished a final at school and was home early. The December day, which had started off with bright blue skies, was now gray but fairly warm. We decided then and there that it was time for a mini adventure, so we did a quick wardrobe change and 10 minutes later we were off in search of a couple caves we had heard about. Tennessee is a beautiful state with amazing state parks. Parks that range from high mountain peaks to the Mississippi delta, from battle fields to Native American burial grounds, from gorgeous blue lakes to diverse river systems. There’s just so much beauty and variety. So, I’ve made it a goal of mine to visit every state park in Tennessee in 2018. Below is my story of my adventure at one park. I stood high on a hill overlooking a vast expanse of water far below me. The lake, glistening blue in the late afternoon sun, was empty save one man fishing from a boat in a shallow cove. All was quiet and tranquil; a picture-perfect spring day at the lake. But this would have been a much different view some 80 years ago, before everything changed. The day, which had begun cool and damp, had turned into a perfect evening full of sun and warmth and the promise of spring on the breeze. It beckoned me to get outside and explore someplace new. So I decided to add another state park to my list- Booker T. Washington State Park. The year was 1973 and things were really looking up for a bit of land in Northwest Tennessee. A state park had been created around a huge cypress tree, one that people came from miles around to look at. They named the park, creativity, Big Cypress Tree State Park. The tree was the oldest and largest bald cypress tree in the United States and the largest tree of any species east of the Mississippi River. The tree was 175 feet tall, taller than any other tree in that bottomland forest. The circumference at the base was 40 feet, while the diameter measured thirteen feet. It was believed to be 1,350 years old and was named the Tennessee Titian. Early morning had brought with it freezing fog that coated all surfaces with a sheen of ice. Now, though, the sun was out and quickly warming everything. The blue skies were such a great sight after days of rain. We were excited to begin our trip, searching for bald eagles. 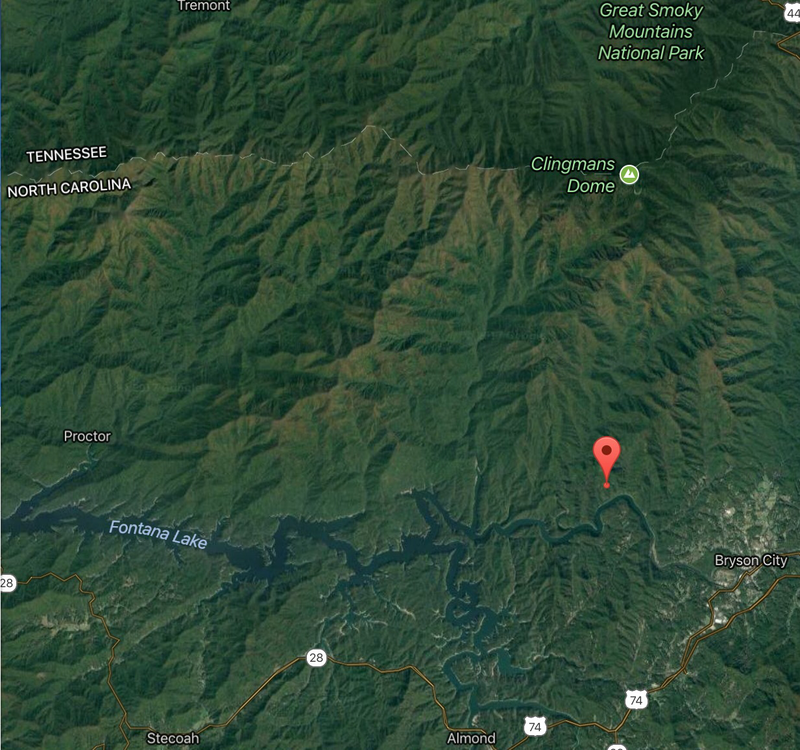 The largest naturally occurring lake in Tennessee is relatively new. During 1811-1812, a series of earthquakes hit the area. They were so strong that they caused the ground to drop ten feet and the Mississippi River to flow backwards for a period of time, filling in that 15,000 acres of collapsed swampland to create Reelfoot Lake. Despite being tucked away in the far northwest corner of Tennessee, close to nothing, Reelfoot Lake gets tens of thousands of visitors every year. They come for the water and the cypress tress, they come to fish and hunt, and they come for the the reason we were there- the bald eagles. Each January and February, Reelfoot Lake State Park offers tours that let you observe and learn more about the American bald eagle. The other day I found myself on a hike different from any other I’ve ever taken; I went on a hike with just my two boys. We are a family of six with two boys and two girls, alternating boy-girl-boy-girl, so it’s just not a combination that has happened in the past. I’m used to hiking with our entire family, the kids running ahead while my husband and I lag behind until our youngest usually ends up joining us. Or sometimes it’s just the kids and me, off on some adventure. 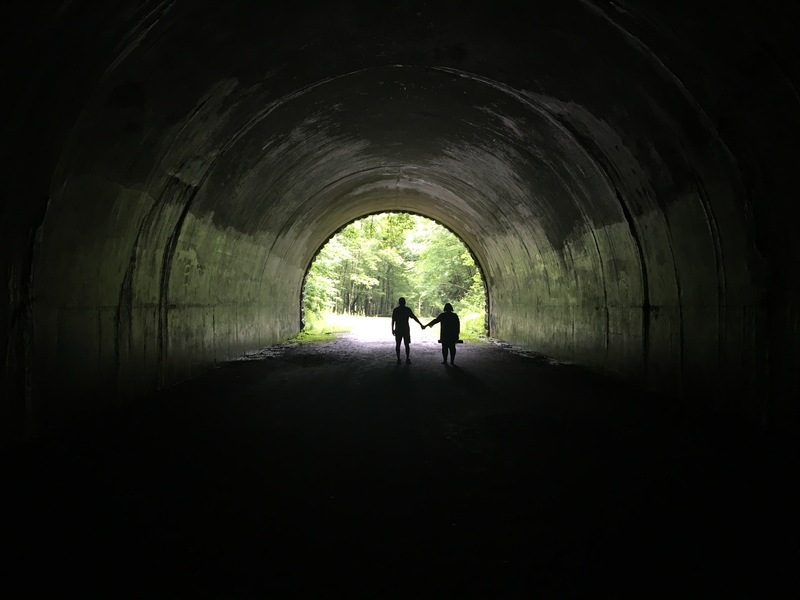 On these hikes, my oldest daughter often hikes with me and we have civilized girl-type conversations or, often with her, just walk along in silence enjoying the day and scenery. But, hiking with just boys is…well…let’s just say different! I stood on a narrow strip of ground and looked at the ice beneath my feet. The ravine was deep here. On one side of me was the creek, snow and ice covered cliffs on the other. I gingerly stepped forward and began to slip. Inhaling sharply, I grabbed at the rock next to me only to get a handful of icicle. “Mom!”, came a yell from behind me and I realized that the kids had followed even though I had told them to wait while I checked things out first. “Well, were all in this together now”, I thought and continued to gingerly make my way forward. Early American hunters and traders traveling ancient, well-trodden paths in what is now Middle Tennessee, came upon a stone structure built on a peninsula created by the confluence of two rivers. Rock and earthen 4-6 foot high walls boarded the entire peninsula. This “old stone fort”, as they believed it to be, sat high on bluffs carved out by fast moving rivers and was protected by a moat on one side. They wondered who had built the impressive structure; thinking perhaps it was Buccaneers or Vikings or some other group of early Europeans, but no one knew for sure. The answer, when it was learned, shocked everyone. January 1st, 2018. Everything always seems so new and fresh and hopeful on January first, as though anything’s possible. I like to start the year with an adventure, hoping it will set the tone for the rest of the year. So, each year, our family does a First Day Hike. State Parks across the country offer these ranger-led hikes as a way to get out, explore, and start the new year right. This year we chose Old Stone Fort State Park. The day was bitterly cold; wind-chills hovering in the single digits. Usually our entire family goes, but this year because of some sick kids and husband, only my 16 year old son and I ventured out. I bundled up- long underwear, multiple layers of clothes, wool socks, hat, two pair of gloves, face mask, boots, and hand warmers- so that when I was finished, only my nose was showing. My son threw on a fleece, hat, and gloves because he “doesn’t get cold”, and we were off. I had often passed the brown signs on the highway for Old Stone Fort State Park, but this was our first time at the park. We arrived and went into the museum where I was surprised to see so many people waiting to go on the hike on such a cold day. We all signed in, finished putting on hats and gloves and scarfs and boots, met the ranger, and were off, back into the cold. There ended up being 41 people and 1 dog on the hike which made me happy to see that so many others liked the tradition as much as we did, cold and all! The hike was a 3 mile loop that followed the rivers. The peninsula that the park is created around is formed by the confluence of the Duck River and Little Duck River. This river system spills over a shelf in the Cumberland Plateau known as the Highland Rim and rapidly drops in elevation as they approach their convergence. This has led to deep gorges cut in the limestone around the peninsula. There are a series many rapids and waterfalls, one of which was our first stop. This was the site of one of a few mills and factories that were built along the river in the 1800s, harnessing the Duck River’s power. We all took picture as the biting wind blew off the water, and then quickly moved along. The hike continued, heading down now out of the wind, to the fork of the Duck and Little Duck River. We turned to now follow the Little Duck River whose banks were edged with ice as were rocks protruding from the middle of the river. Yet it was a beautiful location. High bluffs behind the river gave privacy to the boulder and tree lined river. It was the perfect spot to wile away a warm summer day- hammock strung between two trees, fishing, napping, and enjoying the peaceful sounds of the river and forest. But not on January 1st! My son and I vowed to come back in the summer! The Little Duck turns sharply here, forming a horseshoe. We followed it until we came to the base of a narrow ridge. The trail turned and we began to climb away from the river up the spine of the ridge. We could now see why the trail we were on is named Backbone Trail. We hiked along the narrow ridge, the river far below us on both sides. Then it was back down the spine. Back in the bottom of the forest again, we reached the Moat Trail; a narrow flat open section. This was where early settlers thought the ancient moat that protected the fort was located. But it never was a moat at all! Our ranger told us that they actually think the Little Duck River once flowed here before, at some point, it rerouted to where it is now. We followed the moat/riverbed for awhile and then the trail turned and climbed sharply. This is the steepest section of the trail, heading up and out back to the Old Stone Fort high on the peninsula. The trail continued with the open grassy area that was the supposed fort on our left and the river flowing through rapids and more waterfalls far below us on the right. And then we learned the truth! This was not an old stone fort as was once thought, but rather an ancient ceremonial site dating back to 30-430AD. Native Americans, not Europeans, had built this gradually over several hundred years. This was before the tribes of Native Americans that we know today even existed. It is thought that no one ever lived here, but would journey to the location for ceremonies. They have found that the sun rises perfectly down the center of the path into the site during the Summer Solstice. A very sophisticated design well before it was thought there were sophisticated people in the United States! Now a great state park with a completely misleading name! You can learn more about the park here. Go and visit it, you won’t be disappointed! Having turned off the highway a while ago, we had been flying through empty fields ever since. Fields that in a few months would be bursting with color and activity, today were empty and void of life. The world around us was monochrome, all grays and browns. The air was the same- seasonless. Neither hot nor cold, breathing it in felt like taking a breath of gray. It was one of those days that gave the feeling of being suspended in time. The road wound it’s way through the farmland; twisting and turning around crumbing stone walls and barbed wire fences. We passed very few cars and saw even fewer people. But we had cows and horses and one smelly chicken farm to keep us company as we made our way to the statues. The statues were the reason we were driving on this country road. Somewhere, hidden deep in these rolling hills were the E.T. Wickham statues of Palmyra, Tennessee. Enoch Tanner Wickham was a tobacco farmer who was born in 1883. In the 1950’s, at the age of 67, he decided to try sculpture, building his first statue of the Virgin Mary crushing a snake out of cement, chicken wire, and rebar. From there he continued to create statues. These statues were life sized and placed on huge bases along the road. He sculpted everything from historical figures like Tecumseh (an Indian chief) and Sitting Bull to Andrew Jackson and Daniel Boone, and even Bobby and Jack Kennedy. He also created a monument to the son he lost in World War II and a statue of himself riding a giant bull. E.T. Wickham, who was self taught, was very proud of his creations and enjoyed showing them to visitors. He did not stop sculpting until his death in 1970. By the end, he had created over 30 statues which were set up along two roads in Palmyra. Unfortunately, with no one left to watch over the massive statues when he was gone, they slowly deteriorated with time and weather and especially vandalism. We drove around a bend and there they were, E.T. Wickham’s statues standing on a ridge, looking out at empty rolling hills. We parked the car and got out to take a closer look. It was a lonely place and the gray of the day seemed to engulf us and fill the silence around us. The statues, once proud and colorful I’m sure, looked macabre. The cement statues, all headless and many missing limbs, were slowly decaying back into the earth. Water stained and covered with moss, they had the look of something ancient. Something timeless. You got the eerie sense that E.T. Wickham’s statues had always been. They guarded the fields and hills and cows high up on this ridge. Despite being headless, they watched and knew and protected. We got back in the car and drove down the road to the next set of Wickham’s stone statues. They were in the same state as the first group, slowly falling apart and crumbling. Weather is one thing, but it was sad to see how much they have been vandalized . Let’s hope that has stopped! They are such great examples of folk art. A beautifully lonely legacy of a man who took to sculpting late in life. A legacy of rural life and of hero’s both local and national. A reminder of a simpler, less cynical time. There’s not a lot left like this. We drove home, back through the twisting roads and empty fields and staring cows. The sun set, the day slipping from gray to black almost unnoticed as we returned to “civilization”. I pictured the decaying statues out there in the dark, guarding the rural countryside, and smiled, happy to have had the chance to visit them. You can learn more about E.T. Wickham and his statues and see pictures of them in their original state here. The statues of Wickham Stone Park are located on Buck Smith Hill Road and Oak Ridge Road, in Palmyra, Tn, about an hour northwest of Nashville. Lakeside Drive. It was a typical enough road, climbing out of downtown as it took us past a school and houses and farms. Typical enough, at least, until we rounded a corner and saw the sign that let us know we were on the Road to Nowhere. Fontana Lake is beautiful. Mountains drop straight down to its’ tourquoise-green waters while fish jump and bald eagles fly overhead. It twists and turns through 30 miles and is so remote that you rarely see another boat. But, it’s what’s underneath the lake that is the most interesting. In the 1940’s, WWII had finally reached America and an increase in aluminum was needed for wartime efforts. The rugged and remote valley of the Little Tennessee River was chosen to create a dam to produce electricity for the ALCOA aluminum plant in Tennessee as well as for Oak Ridge National Laboratory’s Manhattan Project. The valley was filled with small towns. People who had been there for generations, working in mines or for lumber companies. People who loved the beauty and isolation of the area. Old Highway 288 connected these communities to each other and to their cemeteries. But, because of the war, things moved fast and, before they knew it, more than 1300 families were forced to leave the area. 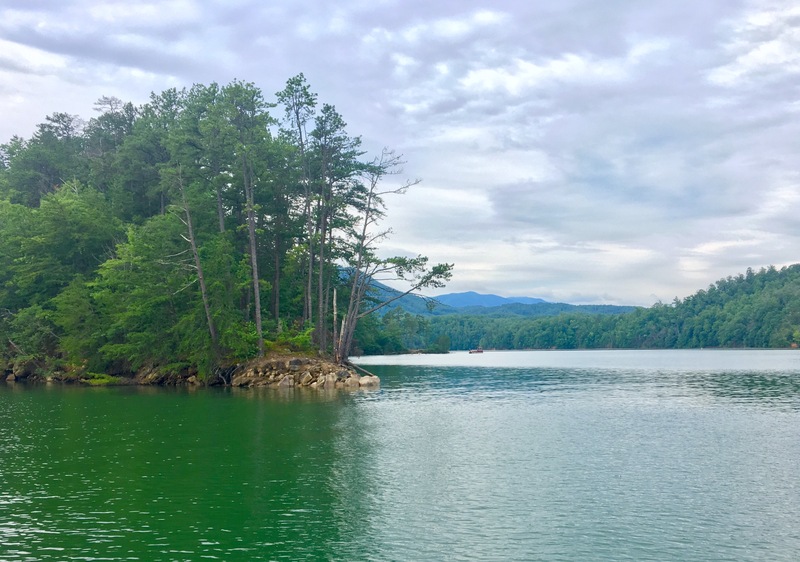 The TVA built the dam, the tallest in the east, in a little over two years and Fontana Lake was formed, submerging the towns and Highway 288 far below. The towns were gone but the Federal government promised to replace Highway 288 with a new road. 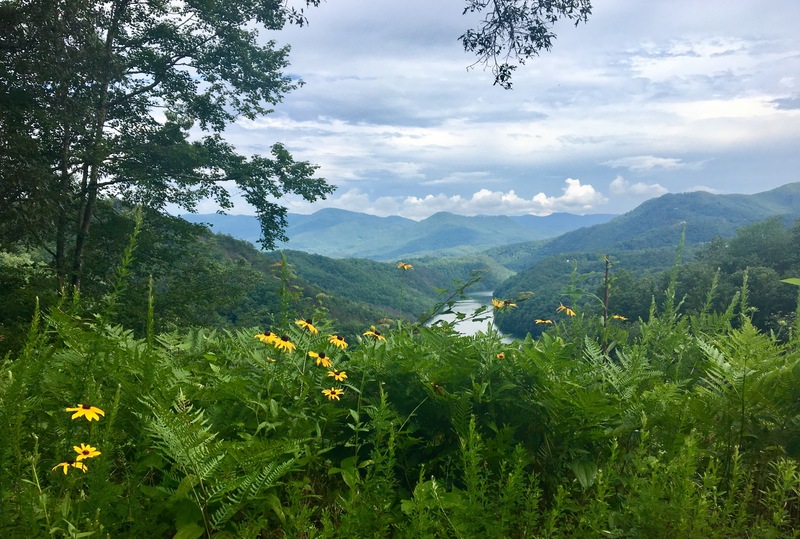 The road was to hug the north shore of Fontana Lake from Bryson City to Fontana, providing a way for the former residents to have access to the generations that remained behind in the old family cemeteries. 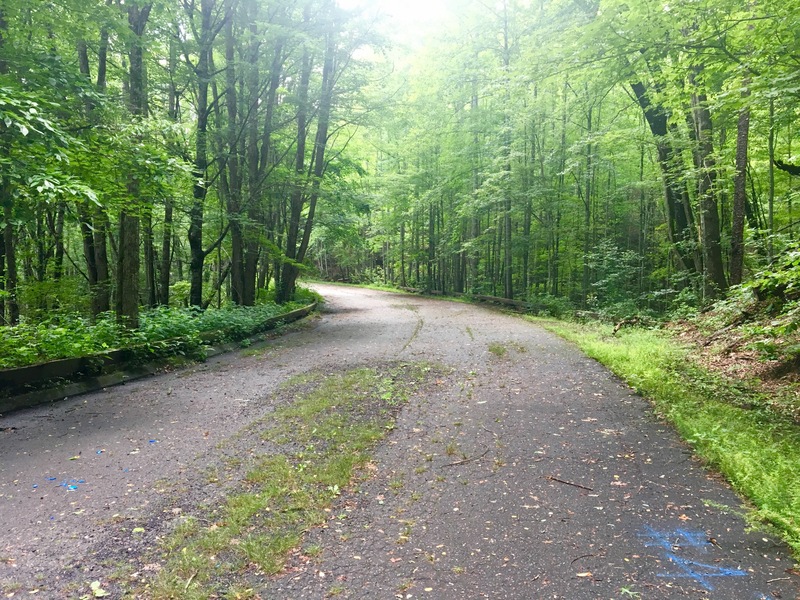 Construction began on Lakeview Drive in Bryson City. 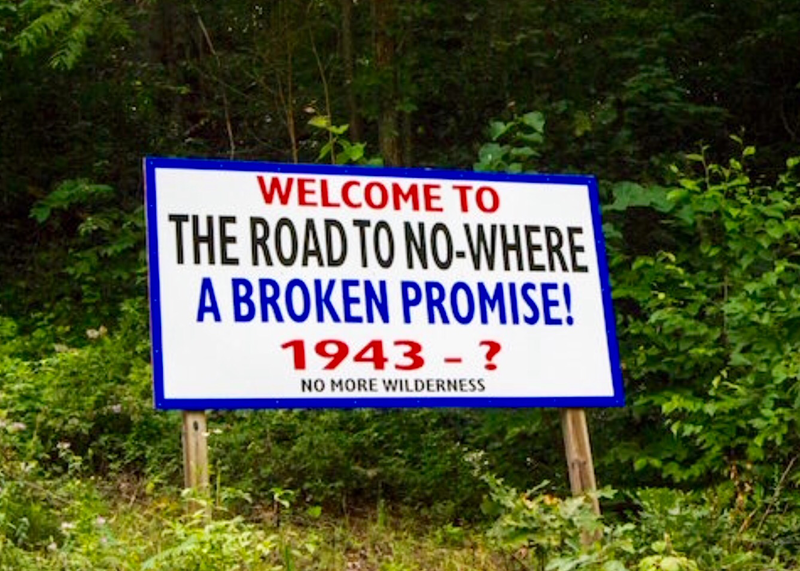 The road entered the Great Smoky Mountain National Park and everything was going well until an environmental issue halted construction. The issue was eventually resolved, but construction of the road never resumed. The road now follows the lake about six miles into the park and abruptly ends at a tunnel. It truly is a “Road to Nowhere”. You can now park at the tunnel and hike through it. Once through the tunnel, the asphalt ends and half finished guard rails give way to hiking trails that continue around the lake. And the cemeteries still remain, more quiet and isolated than ever. The only way to access them is by hiking in or taking a ferry that the Park Service offers during the summer so former residents can visit their ancestors. One of the only reminders that this was once a valley filled with small towns bustling with activity. Below is a map of the area. 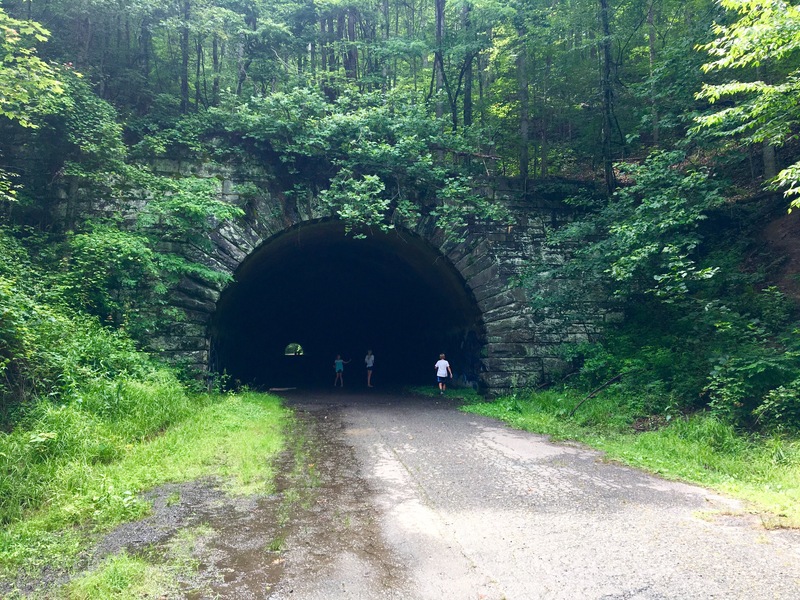 You can reach the tunnel by taking Lakeview Dr. East (aka the Road to Nowhere) out of Bryson City. The road ends at a parking area near the tunnel. "Its better, to make your mistakes than to live with out knowing. Its better, to fall on your face then to stay on your feet. As long... as you tried your best" - Greg Holden "The Art of Falling"